Podere Curcio is one of those hidden jems in wine country one imagines all his life! Handed down from generations, the farmhouse has kept its simple country feel that makes you feel at ease the minute you arrive. Surrounded by vineyards, olive trees, roses and inhabited with Alberto Inglesi's sculptures, the house has a very special, unique feel. The high up position on the hills of Vagliagli offers open views over the castles in Chianti classico as far as San Polo in Rosso and Mount Amiata on the other side. The owners are the best Siena tour guide and the most famous contemporary Siena artist. They are very passionate, creative, generous people who love comfort and beauty. They have been restoring the property for the past 5 years and are turning it into a very fine yet rustic boutique spa retreat. The wellness room hosts a 4 seater Jacuzzi and an infrared sauna in the panoramic loggia which is completely glassed and kept to calidarium temperatures (25-32°). A charming stone staircase leads to the fascinating Turkish steam bath downstairs, elegantly painted by Alberto. The lower ground wellness area also hosts showers, bathroom and a marvellous massage room. The farmfeatures two large apartments sleeping up to 6 and an independent barn sleeping up to 4. The large gardens and huge panoramic swimming pool ensures all guests have plenty of space to enjoy their privacy. The pool was recently newly paved and a new external hot tub was put in. It offers vertical and horizontal hydrojets as well as a waterfall. It was designed and built by Alberto himself with stone and marvellous new materials for top functionality and amazing pleasure! 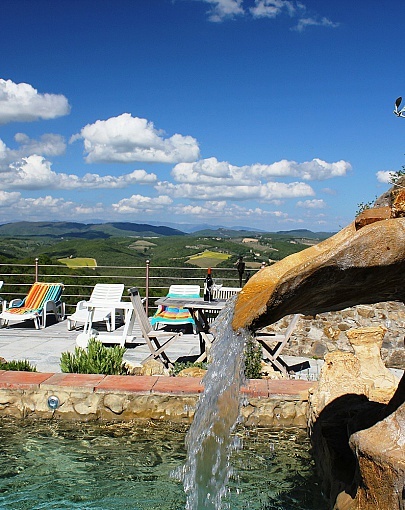 The property is on a farming estate producing fabulous Chianti wine, olive oil, fruit, veggies and cured meats. You can see the animals taking a lovely walk down the track in the woods below the property. there are goats, Cinta senese pigs, phaesants, ducks as well as plenty of wildlife! The house is just 1,5 kms from the village of Vagliagli where you have shops and amenieties. 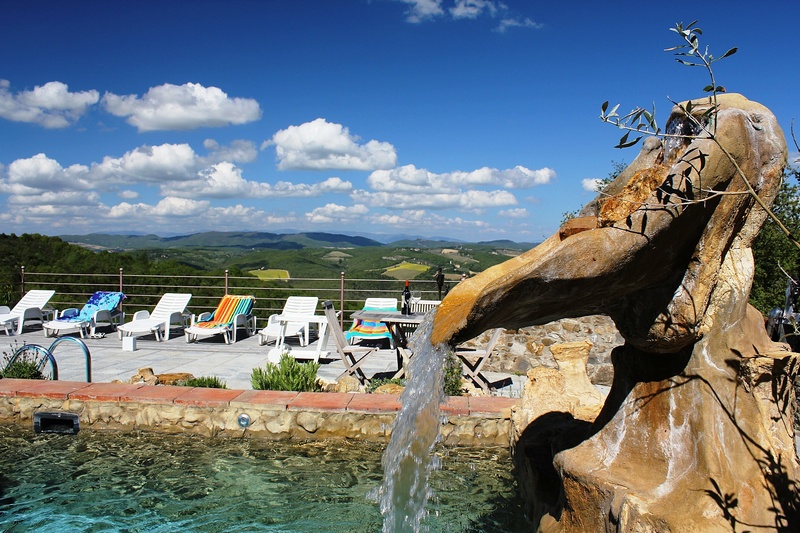 La Grande was designed to be the owners' country residence and offers very bright and spacious rooms with a breathtaking panorama over the most authentic Chianti hills. The apartment has two independent entrances and develops around the large panoramic lounge off which opens the large private terrace equipped with table, chairs and umbrellas, the large kitchen with wood oven and the dining room with fireplace. The rooms are really very large and bright. Off the lounge is a corridor leading discretely to the bedroom area hosting 2 large doubles and a twin room and 2 bathrooms, one with both bath tub and shower enclosure and one with a shower. An ancient wooden door in the lounge leads into the wellness area, of which La Grande guests have exclusive access. La Mansarda, which translates into 'the loft', is a simple 4 bedroom apartment sitting on the top floor of a charming farming estate in the heart of Chianti Classico. A welcoming terrace offers its guests a precious spot to enjoy the breathtaking views and the romantic sunsets over the valley towards San Polo in Rosso. Inside, the Loft features a large lounge with fireplace, dining area and American style kitchen. The 4 bedrooms and 2 bathrooms (one with bath and one with shower) make it perfect for families or groups of friends of up to 6 people. Guests have access to the large swimming pool, the organic garden, the outdoor hot water whirlpool and the many marked walking paths around the property. This apartemnt is only available for rent between May and September as it does not have heating. Capanna is a very cozy, intimate, independent barn on the larger estate Podere a Cignano. The barn sits in a discreet position of the estate, has a private terrace eqipped with BBQ, table, chairs and umbrella. It has a direct access to the large panoramic swimming pool and the outside hot tub. Inside, the barn offers a cozy lounge with fireplace, a fully fitted kitchen, a twin and double bedrom and a bathroom. The decor is very simple, typical of country houses, yet fully functional.